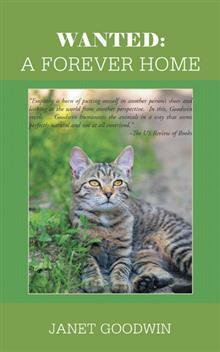 Wanted: A Forever Home is a heart-warming tale where we share the thoughts, fears, loneliness, and joy of Senora, a toffee-nosed house cat, and ten very individual and determined street cats whose lives are all torn apart until they meet up with Gentleman George, a Portuguese mountain dog whose one mission in life has always been to obey the commands of his master. When George is commanded to find the scent of Bella, a street cat whom he has never seen, and return her to her forever home, his task proves far more complex than he could have ever imagined. But his troubles are only just beginning when he later finds himself shepherding a flock of cats across the Spanish countryside with all its unexpected twists and turns. Born in Harrow, Middlesex, and educated at a boarding school on the east coast of England, Janet Goodwin went on to make a career in the production of television commercials. During this period, she and her husband, lived for four years on Ibiza in the Baleares. She is retired and living in Spain with her American husband, plus their three dogs and Lucy their cat. In 2005 they founded a charity for the protection of abandoned animals in Spain and, together with many volunteers, have been involved with the sterilization of street cats and finding ‘forever homes'. Wanted: A Forever Home is her first novel. Janet is giving away a $25 Gift Card! This giveaway begins February 6 and ends on February 17. Winners will be contacted via email on February 18.